This photo of the partial solar eclipse of Sept. 13, 2015, was snapped by astrophotographer K.J. Mulder from his home in South Africa. Another year of skywatching is upon us, and there's a lot to look forward to in 2016. Here are some of the more noteworthy sky events — including multiple meteor showers and a total eclipse of the sun — that will take place this year. Space.com's Night Sky column will provide more extensive coverage of most of these events as they draw closer. Jan. 19: Occultation of Aldebaran. A waxing gibbous moon will cross in front of one of the brightest and most colorful stars in the sky, orange Aldebaran. This stellar eclipse will be visible over Canada and most of the United States, except the Gulf Coast and Florida. Here is a chart of some of the don't-miss spectacles that the sky has to offer in 2016. See the full calendar infographic here. March 8-9: Total eclipse of the sun. The dark umbral shadow of the moon will trace a curved path primarily over the Southeast Asian islands of Sumatra, Bangka Belitung, Borneo, Sulawesi and Halmahera. Then, the umbra tracks out over the Pacific Ocean for the remaining two-thirds of its course. The maximum duration on the centerline of the totality path is 4 minutes and 10 seconds. Because the shadow tracks from west to east, it will cross the international date line — so the solar eclipse will begin March 9 and end March 8! 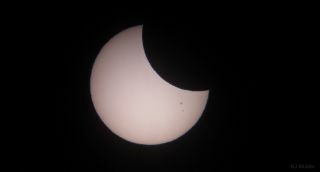 A partial eclipse will be visible from parts of Alaska and from the Hawaiian Islands. March 23: Penumbral eclipse of the moon. Two weeks after passing between Earth and the sun, the moon will come around to the other side of its orbit and just barely encounter our planet's shadow. The moon will pass through the northern part of Earth's shadow, missing the dark core shadow (known as the umbra) and interacting with the fainter penumbra instead. As a result, the lower portion of the moon will appear noticeably smudged or tarnished. This darkening will be evident to those along the West Coast of North America just before moonset. May 21: A "blue moon" with Mars. Many people know about the so-called "blue moon rule," which states that, if two full moons occur in a single calendar month, the second one is called a "blue moon." However, this is actually a misinterpretation of the original rule, which involves four full moons during a specific calendar season (instead of the usual three); the third full moon of the four was called a blue moon. This latter case applies on May 21. In addition, Mars, which is very close to its opposition, will appear to blaze almost directly below the moon on that date. Late spring: A very favorable apparition of Mars. The Red Planet shines like a star with a yellowish-orange hue and can vary considerably in brightness. In 2016, Mars will appear brightest fromMay 18 to June 3. Mars arrives at opposition to the sun on May 22. Opposition is the moment when Earth, the sun and another planet (Mars, in this case) are all aligned, with Earth in the middle. On May 22, the Red Planet will rise at sunset, peak high in the south at midnight and set at sunup the next day. Mars will then be shining at its brightest for 2016, at magnitude minus 2.1 — nearly twice as bright as Sirius, the brightest star in the sky. Eight days later, on May 30, Mars will make its closest approach to Earth for the year at 5:35 p.m. EDT (2135 GMT), at a distance of 46.8 million miles (75.3 million kilometers). Because Mars can come as close as 34.6 million miles (55.7 million km) to Earth (as was the case in 2003), this year's approach can be considered a fairly close encounter. In the weeks and months following opposition, from the end of May on through the balance of the year, Mars will become a fixture in the evening sky, but it will also be receding from the Earth and consequently will get progressively fainter. July 29: Another occultation of Aldebaran. This one occurs in the dawn twilight and involves a waning gibbous moon. The occultation will be visible over western Canada and the United States, low in the east-northeast sky before sunrise. Aug. 28: A brilliant double planet. Shortly after sunset, in the west-southwest sky, the two brightest planets, Venus and Jupiter, will be strikingly close together. As seen from the Atlantic Seaboard, for example, only 5 arc minutes (or one-sixth the apparent width of the moon in our sky) will separate the two, making for a very eye-catching sight! Oct. 19: Aldebaran occulted again. A waning gibbous moon will again pass in front of Aldebaran, the angry eye of Taurus the Bull. This occultation will be visible over eastern Canada and most of the United States, except parts of the Northern Plains and the Pacific Northwest. Nov. 14. The "supermoon." The full moon that occurs on this day will also very nearly coincide with perigee, the object's closest approach to Earth for the year, in an event popularly known as a supermoon. The moon will turn full at 8:52 a.m. EST (1352 GMT), just 2.4 hours after it comes within just 221,541 miles (356,536 km) of the planet. (The moon's average distance from Earth in its elliptical orbit is 238,900 miles, or 384,470 km.) The last time the moon came this close was on Jan. 26, 1948. Expect a large range in ocean tides (exceptionally low to exceptionally high) for the next few days. Dec. 13-14: The Geminid meteor shower and yet another occultation of Aldebaran. If there is one meteor display guaranteed to put on a very entertaining show, it's the Geminids. Most meteor experts put the Geminid shower at the top of the list, surpassing the August Perseids in brilliance and reliability. In many cases, this would be your chance to see an average of as many as two meteors every minute — 120 per hour! But sadly, the moon will be full this night, likely making it hard to see all but the brightest of the Geminid meteors. However, there is a consolation prize: For the fourth time this year, the moon will occult Aldebaran for much of North America. Editor's note: If you capture a great photo of Venus, Saturn or any other night-sky sight and want to share it with us and our news partners for a story or gallery, we want to know. Send your images and comments to spacephotos@space.com.